Not much getting it done in the last week so my task this week is to get back on track. Here's the first of two articles for today with more doubling and tripling up to come in the next few days. I have been a massive fan of Clive Barker for over twenty years. Weaveworld and Imajica alone I have read at least half a dozen times each and read both of them again in the last two years. Indeed, it seems incredible to me that in this time of Game of Thrones and tediously overlong Hobbit adaptations that neither of these epic fantasy horror novels has been turned into a mini-series. It would be easy to do them wrong, but just as easy to get them dead right. 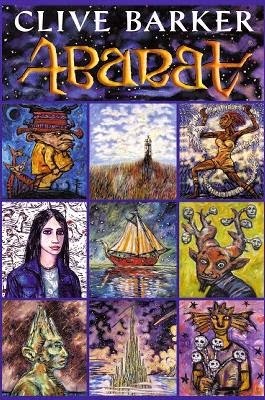 I’ve gotten a little behind with my Clive Barker reading in recent years and so have just finished reading 2004’s Abarat, the first novel in a planned quintet (three of the four have been so far published). In many ways, Abarat is exactly what one would expect from the man who gave the world Pinhead and Hellraiser. As with all Barker novels, Abarat is about a world which lies beyond our world. In the middle of nowhere, outside a nondescript Minnesota town, is a lighthouse thousands of miles from open water, the last relic of an ancient jetty. Yet this lighthouse houses a mechanism which, when triggered, brings the sea, the Sea of Izabella, to the Mid-West. In the waters of the Sea Izabella lies the twenty five island chains of Abarat, each island permanently stuck in a different hour of the day or night, with the twenty fifth, Odom’s Spire, a mystery to many. Many ambitious men wish to rule Abarat entire, including the psychotic Christopher Carrion, ruler of the island of Midnight. Carried on the waves of the Sea of Izabella, schoolgirl Candy Quackenbush is swept into Abarat from Chickentown, Minnesota. For Candy, read Alice or Dorothy, for Abarat is essentially a fable for children and adults alike, as with the 1992 novel, The Thief of Always. This is Clive Barker though and all the usual fantastical and grotesque characters are to found in abundance, like John Mischief, a practiced thief with horns on which grow the seven additional heads of his brothers. Abarat owes much to the genre in which it takes its place, not just Alice in Wonderland and L. Frank Baum’s Oz books, but also The Lion, the Witch and the Wardrobe, Hans Christian Anderson and the Brothers Grimm. I definitely prefer Barker’s adult novels and short stories, as he’s at his best when his imagination is allowed to be unfettered and uncensored (the comic book adaptation of Rawhead Rex, for instance, would give any child nightmares for weeks with its graphic depiction of a child’s entrails being devoured by the eponymous hell beast). Yet it’s a decent enough tale and I’m looking forward to reading the sequel, Days of Night, Nights of War, the edition illustrated by Barker of which I picked up from a second hand bookshop for £2.99. Bargain.